One of Suffolk’s best-kept secrets is St Mary’s church, Chilton; now redundant and in the care of the Churches Conservation Trust, it is marooned in the middle of fields and usually locked so presents a challenge to visit. Yet it is worth persevering to get in, not least for the fine tombs to the Crane family. 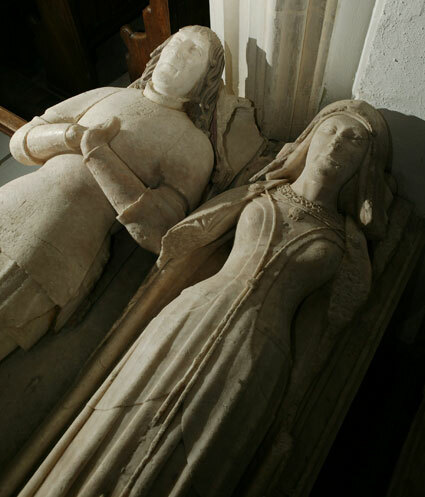 This feature focuses on the alabaster tomb monument commemorating Robert Crane (d. 1500) and his wife, Anne Osgard, Lady Arundel (d. 1508), located between the sanctuary and the brick-built Crane chapel on the north side of the church. 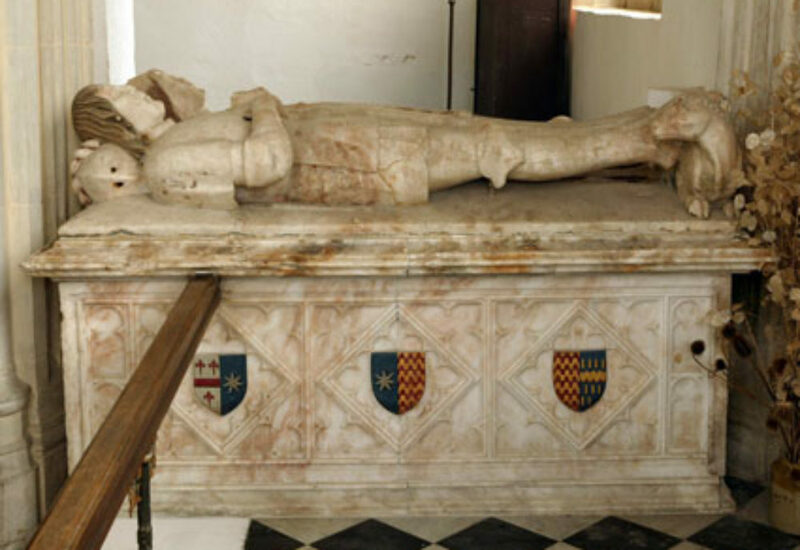 We know that Robert personally chose how he wanted to be depicted on his monument as his will reveals that he had commissioned the tomb in his lifetime. He specified ‘My body to holy sepultur that is to say in the tombe of alabaster standing in the chauncell of Chylton church’. 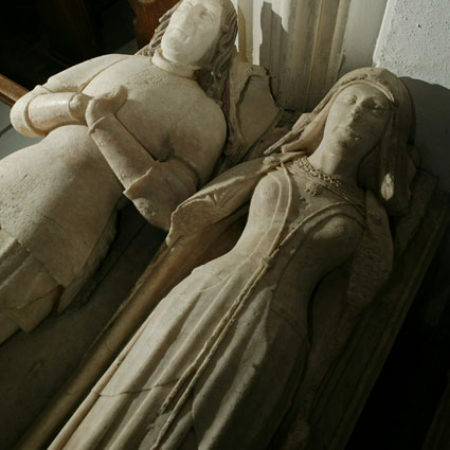 A date in the early 1490s is confirmed by the fact that the effigies are very similar to two other pairs in East Anglia, at Wethersfield (Essex) to Henry Wentworth (d. 1484) and at Wingfield to John de la Pole, 2nd duke of Suffolk (d. 1491). This last, which was probably commissioned after his death by his widow, Elizabeth of York (d. ?1503), sister of Edward IV and Richard III, is finer than the other two, but the basic pattern is the same. 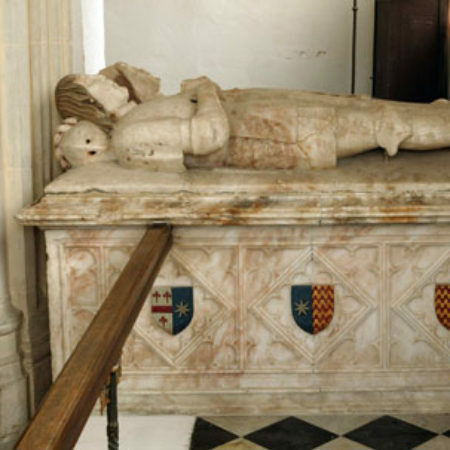 When his widow made her will in 1508 she asked for burial ‘in the chapel annexed to Chilton Churche by the Grace of Robert Crane sumtyme my husband’. This proves that the Crane chapel was built by her husband in the late fifteenth century, possibly at the same time providing a chantry there; certainly Anne refers to the chantry priest in the extensive plans for her funeral set out in her will. Copyright: Sally Badham. Photos: C.B. Newham. Thanks to Simon Cotton for help with wills. 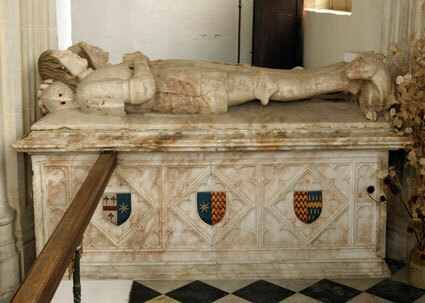 The effigies of Robert and his wife lie on a high tomb chest decorated with square foliated panels which have shields that are set within foliated lozenge panels. The heraldry on the chest is coloured with modern paint. The arms shown are: south side L-R (1) argent, a fess gules, between three crosses botonny fitchy gules [Crane], impaling azure, an estoile argent; (2) azure, an estoile argent, impaling gules, five bars wavy or; (3) gules, five bars wavy or, impaling azure billetty or, a fess dancetty or. 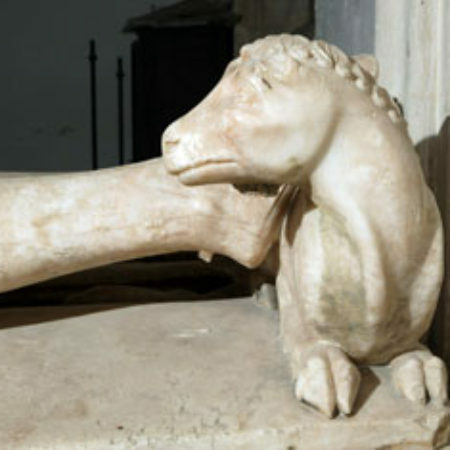 Robert is shown straight-legged with the hands held in prayer and the feet resting on a unicorn, with the horn originally attached to the head by a dowel. 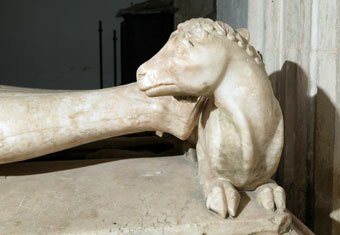 The head, which is bare, rests on a mantled frog-mouthed helm with the crest originally secured by two dowels. The armour consists of standard of mail, vambraces, couters, breastplate, plate skirt, tassets, presumably the lower edge of the hauberk, cuisses, poleyns with large scalloped side-wings and two additional lames above and below, greaves and broad-toed sabatons. Worn over the armour is a tabard, which would originally have been painted with his arms. The remains of the dagger cord is attached to the skirt by a staple. Dame Anne is depicted in a cloak over a surcoat ouverte and wears an SS collar. On her head she wears an early version of the gable headdress which remained in fashion into the 1530s. Some of the original polychromy remains on it on the side facing the chapel, revealing an elaborate scrolling pattern in red and providing a tantalising glimpse of how richly such monuments were once painted. The iconography of Robert’s tomb is all about status and lineage, with no religious imagery. This accords with Robert’s will shows him to be a man of conventional piety. He was concerned for the fate of his soul, but not unusually so. He left 40s to find a good priest to say prayers for his soul so that he might speed his progress through Purgatory. He also provided for masses at various friaries, including at Sudbury, Cambridge, Syon, Shene and the London Charterhouse, and convents at Sudbury, Clare and Bruisyard. More ambitiously he asked for a mass of the Scala Celi at Rome, although oddly he provided only 6s 8d for this; his widow made the same provision but allowing a more generous 40s for it. The original Scala Coeli pardon was attached to an altar at the abbey of Tre Fontane in Rome. To visit the chapel and have a mass celebrated on behalf of an individual after death would give great benefits to the soul, variously described as freeing the soul from the pains of Purgatory at once or swiftly. Its reputation was international, and from the end of the fourteenth century some Englishmen left bequests for pilgrims to visit the chapel on their behalf. Robert asked that all the friars at nearby Sudbury attend his funeral; each of them would receive 20d in recompense. On that day there were to be doles distributed to the poor of various Suffolk parishes. A personal touch concerning his peity is provided by his bequest ‘to my suster Appulton my Releqwikis aboute my nek’, which must have been holy objects in a little case. The Society is a registered charity. © Copyright 2018 CMS. All rights reserved. If you are interested in tomb carvings and want to know more about them or help with their conservation, then the Church Monuments Society is for you.